The Live Aloha Hawaiian Cultural Festival serves to promote, perpetuate and share the Hawaiian culture in the Pacific Northwest by enriching and strengthening the Hawaiian community and celebrating the arts and culture of Hawaii. This family-oriented cultural event is a great opportunity for Washington residents to experience the culture of Hawaii that is available to them right here in the Pacific Northwest. The Census Bureau estimates that there are 50,000 Hawaiians and Pacific Islanders in Washington State. Out of this number, 17,491 people migrated from Hawaii to the Greater Seattle area from 1995-2000. As the population of Hawaiians grows in Washington, so does the number of generations born here away from their home and culture. The Live Aloha Hawaiian Cultural Festival is Washington State's premier Hawaiian cultural showcase, a celebration of Hawaii's music, dance and history intended to preserve and perpetuate the unique island traditions. 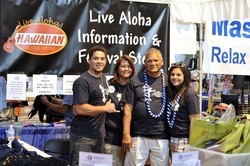 Along with our committee that puts in countless hours to this event, we must also send a big mahalo to the many community members that volunteer for Live Aloha on the day of the event! Mahalo nui!